Want to know about Sigatoka? Discover here this pretty riverside town set on the edge of the Coral Coast. It's all here from it's attractions to accommodation. 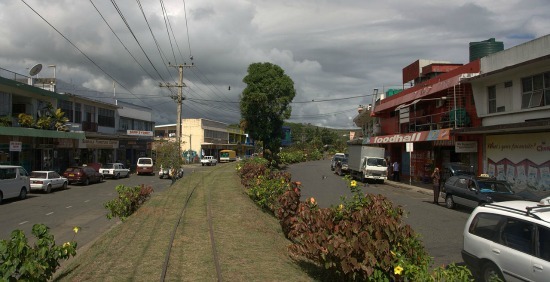 Sigatoka has a population of around 9,500 and is 61 kilometres from Nadi. Situated on the mouth of Fiji's second largest river, Sigatoka River, it's the commercial hub for sugar cane and vegetable farmers from the Sigatoka Valley. The valley is referred to as Fiji's 'Salad Bowl'. Sigatoka is also the centre of tourism for the Coral Coast. The Coral Coast is named as such from the offshore coral stretching from around Sigatoka to just before Suva on Viti Levu's southern coast. This is where you will find many of the leading resorts and hotels in Fiji. For the rugby fans out there, Sigatoka is also known as 'Rugby Town'. The region constantly boxes above it's weight churning out one international rugby star after another. Maybe it's the vegetables from the rich Sigatoka valley soil. The town centre is small, so just follow your nose from Queens Rd onto Sigatoka Valley Rd. Taxi - around FJ$80 from Nadi or $120 from Suva. There are some excellent attractions around Sigatoka. Find them out in our 5 Things to see in Sigatoka Fiji section. Sigatoka itself doesn't really offer any nice accommodation options, as you come to visit rather than to stay. The Coral Coast's resorts starts in force from just outside the small village of Korotogo, 4km west of Sigatoka. 11km to the east is Yanuca which has the famed Shangri-La Resort & Spa located on it's own private island just offshore.